Nicole Madison Lovell was, by all accounts, at that awkward stage of growing up that all kids go through: clinging to childhood ways while beginning to venture into the adult world. The 13-year-old still played in the snow with much younger children, a neighbor said. Her mom said she loved pandas and kept toys from the "Minions" movies in her bedroom -- the same room where she apparently blocked the door and climbed out a window after telling 8-year-old friends she would sneak out that night to meet her 18-year-old "boyfriend." Nicole was believed to be carrying a blue blanket with yellow Minions on it when she vanished, police said. Like others her age, Nicole was tech-savvy, posting on Facebook and chatting in other social media. Unlike her peers, she had to take medicine every day to keep her transplanted liver from failing, and survived other harrowing health problems earlier in life that left her with a tracheotomy scar in her neck and made her a target of bullies. Police say preliminary indications show Nicole was stabbed to death soon after she was discovered missing last week, but they're revealing little else. David Eisenhauer and Natalie Keepers, both engineering majors at Virginia Tech, are jailed on charges that could imprison them for life. Friends and relatives are gathering to say goodbye to "Coley," who's been called sweet, energetic, outspoken and friendly -- "an angel," according to longtime friend Davy Draper. Both Thursday's funeral and visitation Wednesday night at McCoy Funeral Home in Blacksburg will be private, they said. The funeral home's online obituary says Nicole was born in Radford, loved to sing and dance, and was a member of Auburn Baptist Church. It includes the family's thanks to law enforcement officials and the community and is accompanied by a portrait of Nicole showing her blue eyes and face framed by long brown hair, superimposed on a background of clouds. Nicole's mother Tammy Weeks, who carried a plush panda bear toy to a police news conference Tuesday, said her daughter had touched many lives before hers was cut short. She became too overwhelmed with emotion to finish her prepared remarks and had to be ushered away. Stacy Snider, their neighbor, said Nicole and her mother had a great relationship. "Tammy spoiled her rotten. Bought her everything she wanted. Everything," she said. Nicole endured a liver transplant as an infant, leaving her with scars that became fodder for bullies, her mother said. She also was diagnosed with lymphoma, spent six months in a coma after developing a respiratory condition, and contracted a drug-resistant bacterial infection. But she always pulled through. Snider said she had known Nicole since she was born. "She was a lovely little girl. Very caring. Very loving. And she wouldn't hurt anybody. And that's probably what got her in trouble," Snider said. Nicole had gone sledding with Snider's 8-year-old twin daughters the day before she disappeared, and Snider found nothing odd about that. "She was just friendly with everybody," Snider said. "I mean, she had friends her age. But I mean, she was a kid at heart." 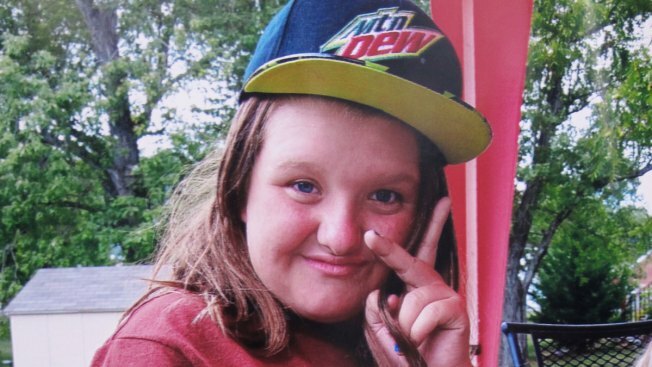 After Nicole vanished, Snider said, her daughters told her that the seventh-grader had showed them a picture of "David," along with a thread of texts they had shared using the Kik Messenger app on her phone. Nicole had told her girls that she would be sneaking out to meet him that night, Snider told The Associated Press. That information was shared with police, and Kik Interactive then gave the FBI the evidence needed to make an arrest, company spokesman Rod McLeod told the AP. Police initially charged Eisenhauer with kidnapping on Saturday, then added murder after Nicole's body was found, two hours south of campus. Another Virginia Tech student, 19-year-old Natalie Keepers, is charged with being an accessory before and after the crime, and helping to dispose of the body. Their attorneys have declined to comment. Meanwhile, at Blacksburg Middle School, Nicole's classmates have been decorating a cherry blossom tree that will be planted in her memory once the weather warms up. O'Dell reported from Richmond, Virginia, and Allen G. Breed from Blacksburg, Virginia.